A new concept in dictionaries, French for Administration, Business and Commerce, will be an indispensable guide for those anxious to understand and use the lexis and idiom of the contemporary French language. 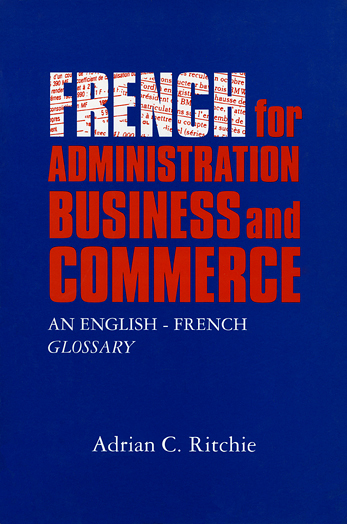 Conscious of the dryness of many technical and specialized vocabularies/dictionaries, and building on the success of his Newspaper French (1990), the author has succeeded in this compact English-French glossary in providing student and advanced learner alike with a practical and user-friendly guide to a wide spectrum of lexis and idiom in the contemporary French language. It should fill a significant gap in the current market by supplying, in handy form, what conventional dictionaries only rarely offer. It is an essentially practical guide, not least because it prefers illustration to definition, supplying for each headword a number of illustrative examples of a wide range of contemporary uses. Headwords, in English, are drawn from a variety of fields - commerce, business, politics, administration and the law - and are illustrated by examples in French drawn from the media, the press and specialized reporting. While these are not meant to be exhaustive, they represent the most frequently met and useful examples of today’s usage. This compact and handy volume should be a boon not least to students moving from a traditional literary background into new registers, and more importantly into a new world where familiarity with the French of the 1990s is of paramount importance.